Amitabh Bachchan is one of the most active celebs on social media. In fact, even at this age, he is aware of the latest trends on social media. 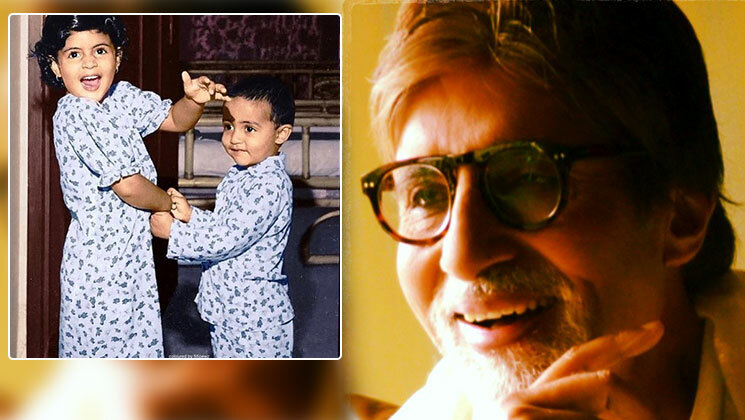 Every now and then, we see Big B treating his fans with throwback videos and pictures of him and his family. An old video has surfaced on the internet where we see papa Amitabh introducing his little son and daughter to the public. The old video seems to be from a stage performance in 1982 and it starts with Big B saying, “Mere do bachche bhi yahan ae hue hain. Mai aap sabko unse milwana chahta hoon.” (My two children are also here and I want to introduce them to you people). Mr. Bachchan then asks Abhishek to say hello and then he asks daughter Shweta to do the needful. Little Abhishek and Shweta then say hello to the public. Have a look at the video. Big B always feels proud of his children and he leaves no occasion to praise them. Earlier in a heartfelt post, he expressed how they have made him “proud”. Here’s his post. Abhishek and Shweta recently appeared in the chat show ‘Koffee With Karan 6’ and they were at their candid best. Both share a great sibling bond and have been with each other through thick and thin.